iOS 5 (s aapl) and Lion are both great updates that are sure to please consumers, especially because they make it even easier to use computers without thinking too much about what goes on behind the scenes. But while the platforms feel deeply and productively intertwined, there are a couple remaining last steps Apple could and should take that would make working back and forth between both seamless. iOS 5 features iMessage, which is a direct messaging platform that can replace text messages when used between iOS devices. You can send photos, videos, contact cards and more, and you also receive sent and read receipts. If you’ve used BBM (s rimm) on a BlackBerry device, it’s very similar. Apple did a great job with iMessage, but the fact that it’s missing from Lion doesn’t make any sense. Lion still comes with iChat, Apple’s IM client, but it doesn’t plug into iChat. It’s great being able to receive messages from mobile devices across all your iOS hardware, but if it could make the leap to the desktop, I could leave behind other IM services and maybe even leave my phone in my pocket more often when I sit down to do work. Facebook and Google (s goog) are likely to be battling for the true cross-messaging pie, and this would be a perfect opportunity for Apple to leverage its user base to get in on that action, too. Let’s hope it comes with an update to Lion once it’s released. Everyone’s impressed with the new notifications system on the iPhone, myself included, but this is another place where I’m left wondering why Apple didn’t borrow more from iOS in the design of OS X Lion. OS X has no native cross-app notification system, although the third-party system extension Growl does the job nicely. But I’d love to see Notification Center on the desktop, and I’d love to see it be able to tie into iMessage and your other accounts. Receiving a notice once and seeing it on whatever device you happen to be using at the moment would be ideal. Especially if a Mac Notification Center could also display content like missed calls from your iPhone, though that might require more cooperation from carriers than Apple can secure. Apple’s latest software updates are very impressive, and that’s why the above two items are really the only things I can think of that are lacking at the moment. But those last two pieces would make for a much more complete picture, so I’m still hoping to see them arrive somewhere down the road. You read my mind! I had the exact same thoughts! I can’t imagine Apple not coming up with a Mac Notification Center. Just hope its this year and works through iChat instead of a separate Mac based iMessages app. Good observations! Many others will want iMessage and Notification Center parity between iOS and OS X and so logically it makes sense that it will be available sooner than later. another required feature would be a unified task manager, what do i mean by that ? lets say i’m copying a large file, a 5Gb movie from my camera to my OSX for editing, while downloading a new copy of Safari, while deleting some files from my hard disk. why aren’t all the windows grouped and slung under a menu item ? with an overall indicator ? bring it to OSX and make our lives all that much easier, please apple. A lifetime ago I bought an little app that let me send and receive text messages to my Nokia from my Mac desktop via bluetooth. It was wonderful but could not be implemented on an iPhone (according to the developer). To use iMessage that way would even be acceptable if we couldn’t get it native on the desktop. Agreed! Lion still uses the same old alert system for iTunes and the Finder which will sometimes pop up and disturb a game. It could be better. 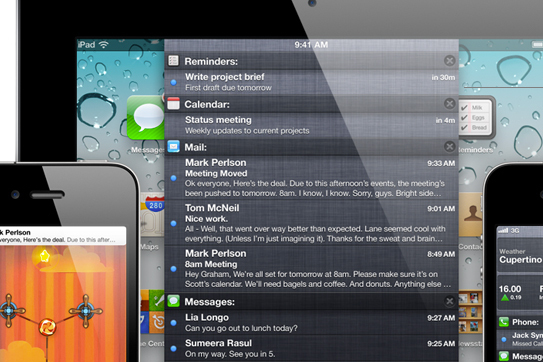 And iMessage in OS X would be very very sweet. A Lion that can’t growl by himself. Nice. Could not agree more. I don’t think it’ll take long for us to see this. What about a quick way to adjust wifi, bluetooth and other high use settings from the home screen? Why is it apple are not doing this? Good call, Mr. Etherington. Duplicating the new iOS 5 notification system with Lion would assist people making the transition to the Mac by creating uniformity. While I like how iMessage completely caught the carriers off guard and could prove to be highly disruptive, its presence with FaceTime on iOS and OS X, along with iChat on OS X, is confusing. There’s no way to merge these somehow or them at least somewhat tied together. Too much redundancy (albeit with some nuances making them different).